It could be clubbed "the new classic." The idea of creating a comfortable passenger vessel encompassing old world classic decor — as per the famed ocean liners of the early 20th Century - while instilling modern safety and mechanical requirements, as well as sophisticated amenities. Last fall, Miami, Fla.-based Celebrity Cruises created its own rendering of this trend via its new "Millennium" Class of ships. With construction currently underway at French shipyard Chantiers de VAtlantique, the inaugural vessel of the four part class is scheduled for a maiden voyage in June 2000. 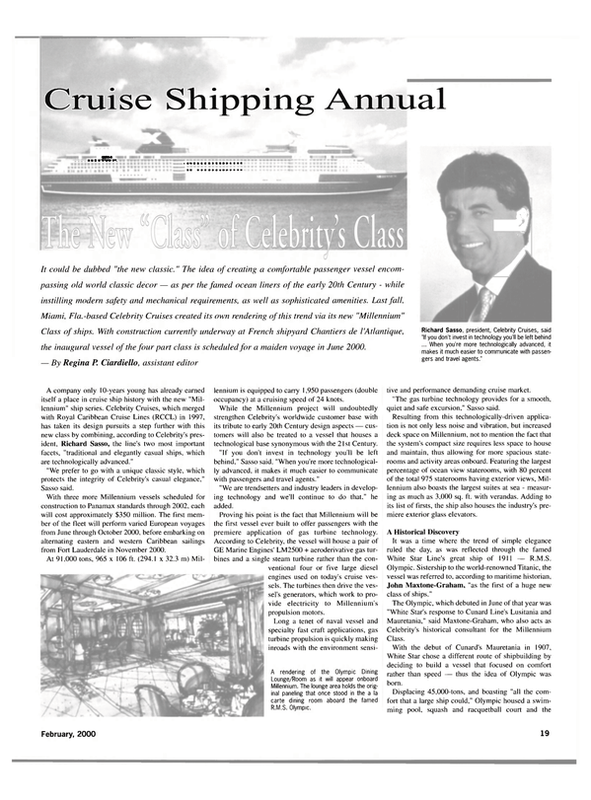 — By Regina P. Ciardiello, assistant editor A company only 10-years young has already earned itself a place in cruise ship history with the new "Millennium" ship series. Celebrity Cruises, which merged with Royal Caribbean Cruise Lines (RCCL) in 1997, has taken its design pursuits a step further with this new class by combining, according to Celebrity's president, Richard Sasso, the line's two most important facets, "traditional and elegantly casual ships, which are technologically advanced." "We prefer to go with a unique classic style, which protects the integrity of Celebrity's casual elegance," Sasso said. With three more Millennium vessels scheduled for construction to Panamax standards through 2002, each will cost approximately $350 million. The first member of the fleet will perform varied European voyages from June through October 2000, before embarking on alternating eastern and western Caribbean sailings from Fort Lauderdale in November 2000. At 91,000 tons, 965 x 106 ft. (294.1 x 32.3 m) Millennium is equipped to carry 1,950 passengers (double occupancy) at a cruising speed of 24 knots. While the Millennium project will undoubtedly strengthen Celebrity's worldwide customer base with its tribute to early 20th Century design aspects — customers will also be treated to a vessel that houses a technological base synonymous with the 21 st Century. "If you don't invest in technology you'll be left behind," Sasso said. "When you're more technologically advanced, it makes it much easier to communicate with passengers and travel agents." "We are trendsetters and industry leaders in developing technology and we'll continue to do that." he added. Proving his point is the fact that Millennium will be the first vessel ever built to offer passengers with the premiere application of gas turbine technology. According to Celebrity, the vessel will house a pair of GE Marine Engines' LM2500 + aeroderivative gas turbines and a single steam turbine rather than the conventional four or five large diesel engines used on today's cruise vessels. The turbines then drive the vessel's generators, which work to provide electricity to Millennium's propulsion motors. Long a tenet of naval vessel and specialty fast craft applications, gas turbine propulsion is quickly making inroads with the environment sensi- tive and performance demanding cruise market. "The gas turbine technology provides for a smooth, quiet and safe excursion," Sasso said. Resulting from this technologically-driven application is not only less noise and vibration, but increased deck space on Millennium, not to mention the fact that the system's compact size requires less space to house and maintain, thus allowing for more spacious staterooms and activity areas onboard. Featuring the largest percentage of ocean view staterooms, with 80 percent of the total 975 staterooms having exterior views, Millennium also boasts the largest suites at sea - measuring as much as 3,000 sq. ft. with verandas. Adding to its list of firsts, the ship also houses the industry's premiere exterior glass elevators. A Historical Discovery It was a time where the trend of simple elegance ruled the day, as was reflected through the famed White Star Line's great ship of 1911 — R.M.S. Olympic. Sistership to the world-renowned Titanic, the vessel was referred to, according to maritime historian, John Maxtone-Graham, "as the first of a huge new class of ships." The Olympic, which debuted in June of that year was "White Star's response to Cunard Line's Lusitania and Mauretania," said Maxtone-Graham, who also acts as Celebrity's historical consultant for the Millennium Class. With the debut of Cunard's Mauretania in 1907, White Star chose a different route of shipbuilding by deciding to build a vessel that focused on comfort rather than speed — thus the idea of Olympic was born. Displacing 45,000-tons, and boasting "all the comfort that a large ship could," Olympic housed a swimming pool, squash and racquetball court and the notable a la carte dining room — the vessel's popular restaurant — that was frequented by Olympic's passengers. After Titanic's tragic and much publicized sinking. White Star returned Olympic to its original builder Harland & Wolff in Northern Ireland, where it received an inner skin to avoid a similar fate. Olympic continued to operate transatlantic crossings until 1935 when it was decommissioned and scrapped in Jarrow, Northumberland. But Olympic still lives today — and not just through memories and drawings. Years later Celebrity discovered that some of the original paneling from the vessel's a la carte restaurant was preserved in an English residence. Its owners, who had purchased the paneling at an auction after the ship had been cut up. recently decided to sell the piece of history to Sotheby's — the Manhattan auction house where Celebrity made its winning bid. Walking into the original a la carte dining room one would be encompassed by the elegant honey-colored French walnut paneling that was flecked by gold colored leaves. Boasting a rose-colored carpet, the Louis XV-inspired room would hold tables with French-backed chairs, as well as an adjacent waiting room where a piano trio played as guests waited to dine. "The paneling will recapture the elegance and glory of one of the North Atlantic's greatest ocean liners," Maxtone- Graham said. The paneling has since been sent to Chantiers for installation on Millennium's historical apex — the Olympic dining lounge. But before taking on this task, the paneling had to be cleaned and restored. A subcontractor hired by Chantiers fixed imperfections such as scratches and discoloration on the paneling. According to Francesca Bucci, an associate at New York City-based Birch Coffey Design, the original paneling for the Lounge Room consists of 40 linear meters of French walnut with gilded details, while the remaining 10-15 percent of the lounge, and the entire wine cellar was filled with a replication of its original. Bucci. whose firm designed the Olympic Dining Room and Lounge aboard Millennium, as well as various public areas, explained that since the paneling is made of wood, it would have to be treated to meet the flammability requirements. "Traditionally, flammable materials would be coated with a special fire treatment," Bucci said. "Since this was a special situation, we could only treat the back of the paneling and sprinkler systems were added in the lounge instead." Bucci also mentioned that an original credenza that once stood in the R.M.S. Olympic's dining room will accompany the paneling in the lounge. Measuring 2 m x 90 cm, the piece will be placed outside of the restaurant's display kitchen. While Celebrity may be taking the path of, as Bucci says, "traditional luxury ambiance," the trends in cruise design are split two-fold. "We basically have two mainstream designs," Bucci said. "The subtle, sophisticated and historical European style, or on the other end, the Vegasstyle. flashy decor. For the moment, these are the most popular trends among cruise design." The Future of the Fleet Celebrity has achieved a healthy growth spurt not only by the merger with RCCL, and the addition of its Millennium Class, but by exceeding its expectations as a whole. "We are very steadfast in delivering a quality product," Sasso said. "We promised a lot. and yet we delivered more." As it would seem highly unlikely at this point in time, resulting from an average of 10.7 cruise vessel newbuilds scheduled each year through 2003, how would Celebrity handle a possible downturn? According to Sasso, who has been involved in the cruise industry for the past 29 years, "Not since the fuel crisis of the 1970s and skyrocketing interest rates of the mid-1980s has the industry experienced such a dip." He added, "Our [the cruise] industry has proven to be successful in down markets, today there are ships out there with greater technology. Ships are more attractive and offer more of a variety of amenities, thus attracting more customers." Although Celebrity might be dubbed by some industry insiders as new competition for other cruise lines that have already made their mark, 2000 could also be dubbed as the year of Celebrity. "2000 is our year," Sasso said. "We'll spend a lot more this year on bigger ships, as well as doubling our fleet size throughout the next five years." Vessel name Disney Wonder Owner Disney Cruise Lines Yard Fincantieri Disney Cruise Lines on October 1, 1999, christened its second vessel, Disney Wonder - sistership to Magic. Dubbed a modern classic, the vessel boasts an Art-Nouveau inspired interior encompassing an entertainment district, restaurants and lobby. Renowned restaurant designer Adam Tihany and glass blower Dale Chihuly are the masterminds behind Wonder's interior creativity. Performing its maiden voyage this past August, Wonder offers the best of land and sea with a three- or four-day Bahamian cruise, combined with three or four days at Walt Disney World Resort. The vessel also spends a full day at the Port of Nassau and Disney's private island - Castaway Cay. Measuring 964 ft. (293.8 m) at 83.000-tons, Wonder is powered by five 16-cylinder diesel engines and two 19 MW General Electric propulsion motors at a cruising speed of 21.5 knots. With a crew of 919, the vessel is equipped to carry 1,750 guests double occupancy (2,400 max. capacity) in 875 staterooms and suites. Vessel name Carnival Triumph Owner Carnival Cruise Lines Yard Fincantieri Despite its delivery delay this past summer, Carnival's newest "Fun Ship" Triumph began four- and five-day excursions to the Canadian Maritime Provinces on July 27. The 102,000-ton vessel was forced into drydockjng on the brink of its launching date due to overheating on the bearing located on one of its shafts. Situated at the home of its builder - Italian shipyard Fincantieri, the vessel underwent a replacement of both shafts, since both utilize the same type of bearing. The shipyard also agreed to compensate Carnival for the resultant delays in launching. Since October 23, the Panamanian-flagged vessel has been operating additional venues to the Caribbean departing from the Port of Miami. Ranked as one of the largest cruise ships, the vessel offers an array of activities and culinary options, such as the Old-World style Vienna cafe, casual Olympic Bar and Club Monaco Casino. Vessel name Mistral Owner First European Cruises Yard Chantiers de l'Atlantique (Alstom) The newest addition to First European's fleet is Mistral, which completed its inaugural cruise from the Port of Genoa in Italy on July 17, 1999. Mistral — meaning "Proven9al wind." was constructed by the Saint Nazaire yard of Chantiers de L'Atlantique. The 48.000-ton vessel was delivered ahead of schedule during the end of June. Equipped to handle 1.200 passengers at 20 knots. Mistral offers weekly summer cruises to the Eastern Mediterranean and the Greek Isles; Transatlantic voyages in the fall via the Canary Islands; and winter excursions to the Caribbean. The 708 ft. (215.8 m) vessel holds 598 staterooms and 80 suites. Vessel name MS Volendam Owner Holland America Line Yard Fincantieri Volendam. the third Holland America vessel to bear the name, was delivered to its owners in October and was scheduled to depart for its maiden voyage on November 12. Constructed at Fincantieri shipyard in Marghera. Italy, the 63,000-gt vessel is classed by Lloyd's Register and measures 781 ft. (238 m) carrying 1,440 passengers at a speed of 23 knots. Issued a Passenger Safety Certificate (PSSC) by Lloyd's on behalf of the Government of the Bahamas, Volendam is a combination of classic and modern features including a $2 million collection of art exhibited throughout the vessel, as well as a lido swimming pool area with retractable glass magradome ceiling. Vessel name Norwegian Sky Owner Norwegian Cruise Lines Yard Lloyd Werft Constructed under the direction of Norwegian Cruise Line's (NCL's) newbuilding team and renowned marine architects Tillberg Design of Sweden, the company was able to deliver its newest — the $300 million Norwegian Sky — on a timely basis. In August 1999, NCL inaugurated the 77,104-ton. 2.002 passenger vessel as the newest member of its fleet, which was constructed at the Lloyd Werft shipyard in Bremerhaven, Germany. Its focal point being a towering eight-deck-high glass-domed atrium. Norwegian Sky measures 853 ft. (259.9 m) in length with a breadth of 105 ft. (32 m) and a 26 ft. (7.9 m) draft. Holding 1,001 staterooms, each measuring approximately 150 sq. ft., Sky also boasts 257 suites each with private balcony. The vessel operates itineraries out of Miami, Seattle and Los Angeles, headed for the corresponding destinations of the Eastern and Western Caribbean, Alaska and the Panama Canal. Vessel name Seven Seas Navigator Owner Radisson Seven Seas Yard T. Mariotti Shipyard Christened in October 1999 by Marilyn Carlson Nelson, chair and CEO of the Carlson Companies, the $200 million vessel Seven Seas Navigator was constructed by Italy's T. Mariotti shipyard to hold 490 passengers. The all-suite vessel, which debuted in the Mediterranean in August with a series of seven- to II-night cruises, measures 560 ft. (170.6 m) weighing 33.000 tons. With 80 percent of its 245 ocean-view suites boasting private balconies, the vessel is the largest — and at 20 knots cruising speed — is the fastest in the Radisson Seven Seas fleet.